My big day out finally arrived. 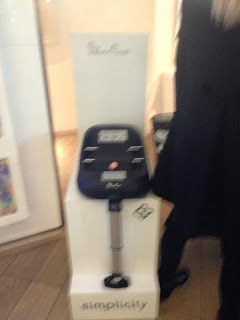 Yesterday I felt very privileged to be heading to The Ivy in London for the launch of 2 new Silver Cross products. This was an exciting yet nervous day for me. 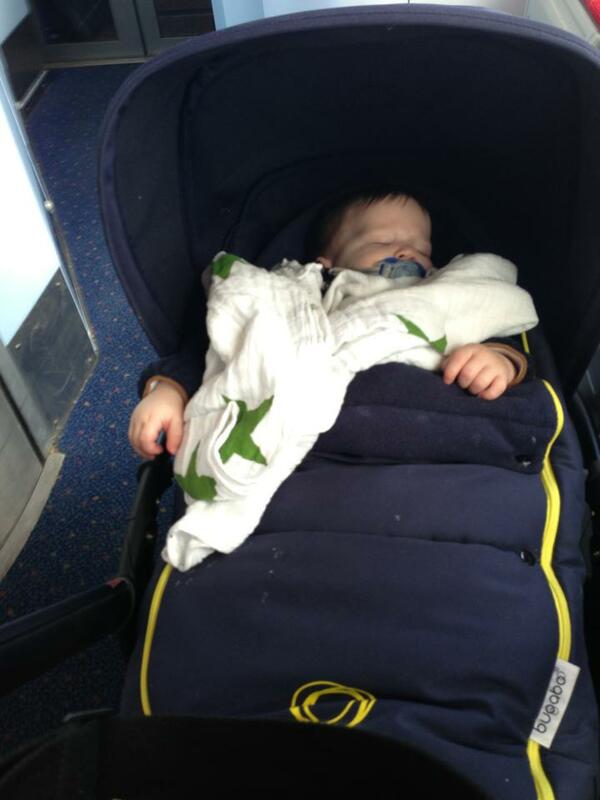 I went from the mum on the school run, to mum and baby in the rush hour on the train hitting London. It also meant leaving the OH in charge of getting the other 4 children up, dressed and out to school. I had everything laid out for them ready, lunches done, bags out, coats and shoes lined up. It was all sorted, and they made it to school unscathed but with bed head! Oh well. Anyway, 2 weeks ago I got the email and was so excited. It was my invitation to the Silver Cross launch and then the name flashed up on the email, WAYFARER. I screeched with excitement and blurted it out over the lunch table to my bewildered mother and Aunts who didn't have a clue what I was on about, 'They are bringing the Wayfarer back' I squealed with excitement. They just all looked at each other like I had gone mad. Excuse my blurry image! This was the original Wayfarer from the 1980's. The reason for my excitement is that I was the owner of one of the Wayfarers that were first produced back in the 1980's onwards and sold in huge quantities. My first born drove around in a Silver Cross Wayfarer, from what a can recall from all those years ago it was a silver/grey frame with a grey ribbed handle a multi coloured flecked seat unit with a wire shopping tray with grey plastic footrest. I always thought the small flat fold was fab, it pushed lovely and was lightweight too. So here we are, 20+ years after it was first launched, at a fantastic relaunch of a Silver Cross classic. We arrived at The Ivy slightly frazzled after a slow train journey that was meant to be fast and me in a panic that I didn't want to arrive late. We had made it! We were greeted by Natasha who I had spoken to via email and was told to set my bags down and help myself to the lovely breakfast that had been prepared. I was standing looking at the new Wayfarer and looking at the old Wayfarer that they had also brought along when a gentleman approached and said that Natasha had informed him that I had owned an original Wayfarer. I said I had and we started having a lovely chat about the original Wayfarer and the Silver Cross coachbuilt prams. Then the lovely gentleman said 'Well, when I purchased Silver Cross back in 2002'.... OMG, I was taking to Alan Halsall! 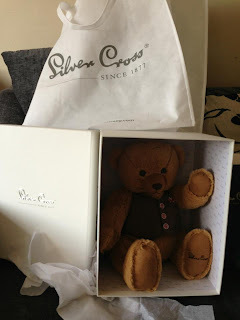 He was lovely and says that he still loves the Balmoral and the coach built prams are the heart of Silver Cross and are sold all over the world still. I agree that the coach built prams are amazing, my Mum loves them too and I did have one for Ella 6 years ago which was kept at my parents house. They are the ultimate pram to have. 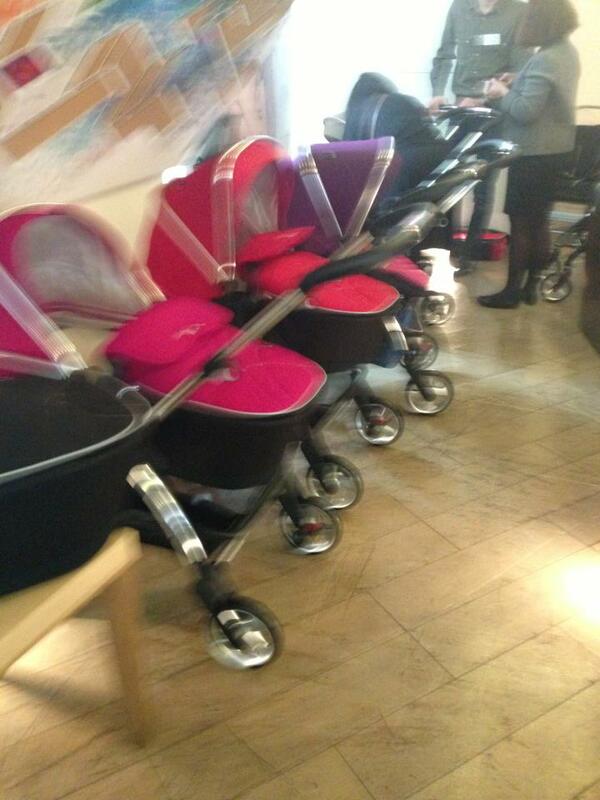 After chatting to a couple of people, I made my way over to the prams. Oh what a sight awaited me. As a pramaholic I was delighted to be there looking at the Wayfarer. It looked fantastic. I stood and listened as Nick ran through the basics of the pram and how it worked but this was to be part of his big talk. We all sat down and Nick began. (Sorry) blurry line up of fuchsia, chilli and purple prams. 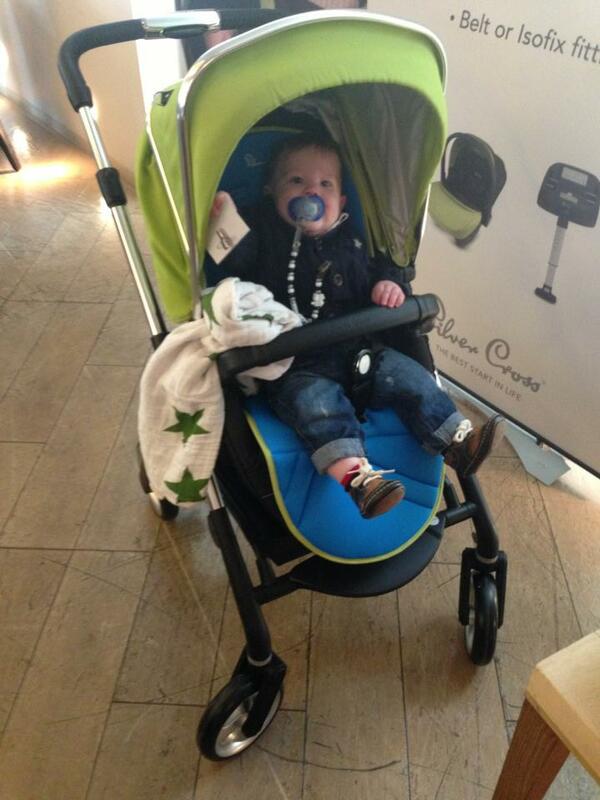 Electric blue in carrycot mode with one of the Wayfarer changing bags in chilli. The Wayfarer 2013 was 3 years in the making and was all built around a big shopping basket, this being the one gripe of the Silver Cross Surf was the small size of the shopping basket. It's amazing suspension set on all four wheels which are perfectly aligned from rear wheels to front with solid tyres. The front wheels were also lockable so you could have them seat to swivel or lock in place, I found this very easy to do and not fiddly at all, I was able to push with my foot to set them to locked and was able to unlock with my foot too rather than having to bend down and have to push some buttons with my hand. Its chrome aluminium chassis weighs in at an impressive 6.5 kg and felt so too. 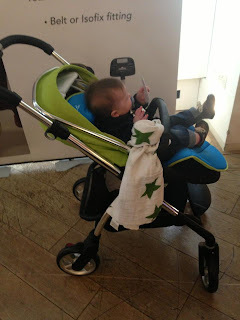 Once I had sat Blake in the pram it still felt effortless to push, even one handed. The braking system features a push on and push off system. After lots of research they found that although it was easy to push a brake on when stopped it wasn't so easy to push a brake from underneath to release it so Silver Cross have made it so that you push down on a little button to release the brake which was so easy to use too. Once available it will be purchased as the chassis, seat unit and carrycot combination, then the hood and apron colour packs are available separately. It also has an matching change bag that can be purchased separately to match the colour of your Wayfarer. The chassis also features a leatherette handle, one touch handle height adjustment which is chrome with Silver Cross embossed on it. It has a 2 lever collapse mechanism and is free standing when folded. It even has a small rubber strip on the chrome to stop scratches when freestanding. 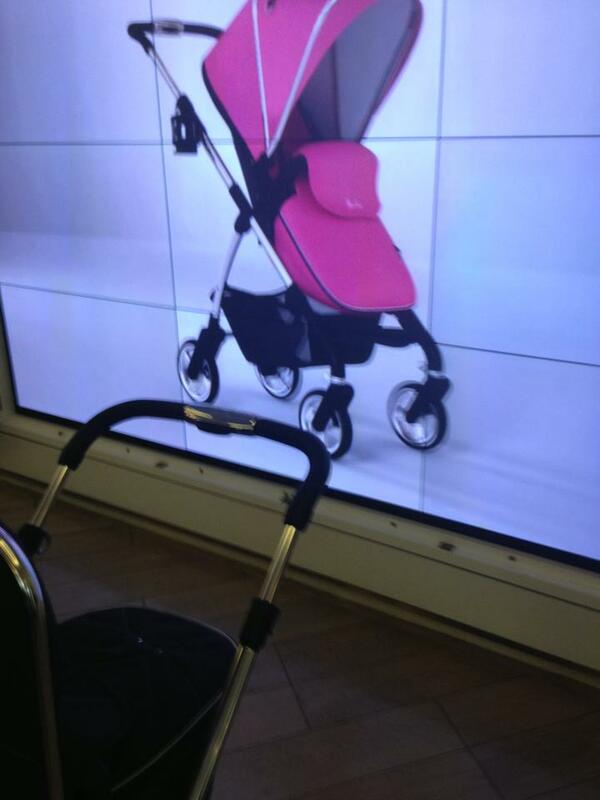 With the seat unit on you can have rear facing or forward facing, the pram can be easily folded in forward facing mode with the seat unit in place too. The seat is lovely size with a 5 point harness and one hand buckle release. It also has a gate fold bumper bar in the same leatherette material as the handle so no chance of little teeth biting chunks out of it like other bumper bars we have come across in the past from other brands. It is also very easy to release on one side and move out of the way to get baby in and out. 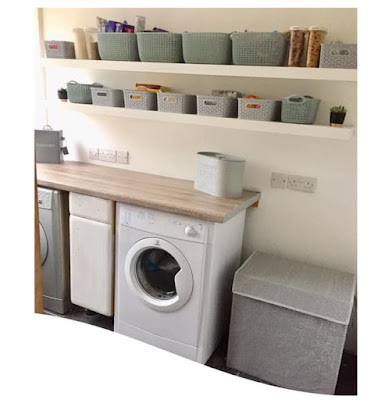 The basket is also solid on both the front and back as extra footrests as baby gets older and makes a handy foothold for toddlers to use to get in and out of the pram easily in either rear ward of forward facing. When being tested by Silver Cross they were able to fit it into the boot of a Toyota Yaris so its a good folded size for small car use yet a good substantial pram when up and ready to go. The 3kg carrycot features a fully removeable liner which is made from bamboo fibre which was so lovely and soft and easily removed to be cleaned, we all know what mucky mishaps small babies can have! 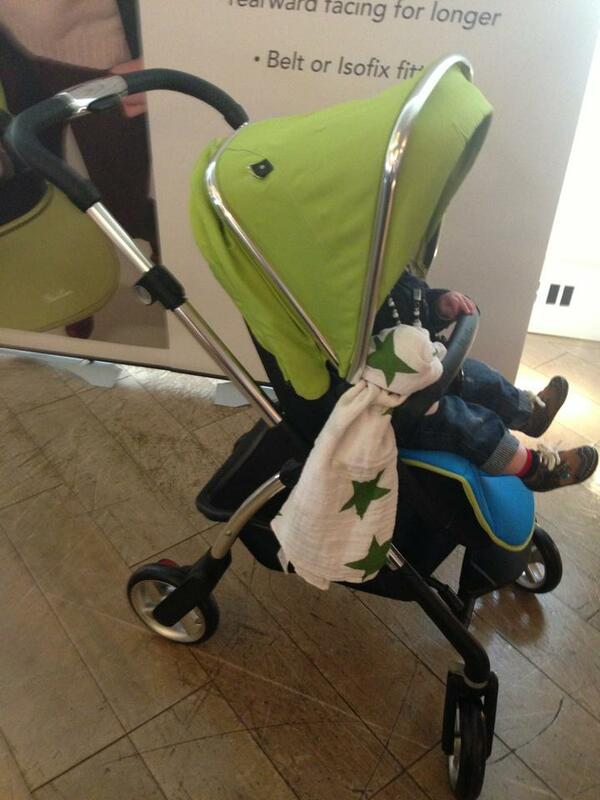 The carrycot uses the hood and cover on it that would then go onto the seat unit once the seat is in use. 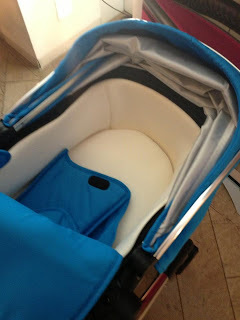 The cover zips onto another part to form the footmuff part of the seat unit which is fab, when you can look at paying anything up to £100 for matching footmuffs for other prams. 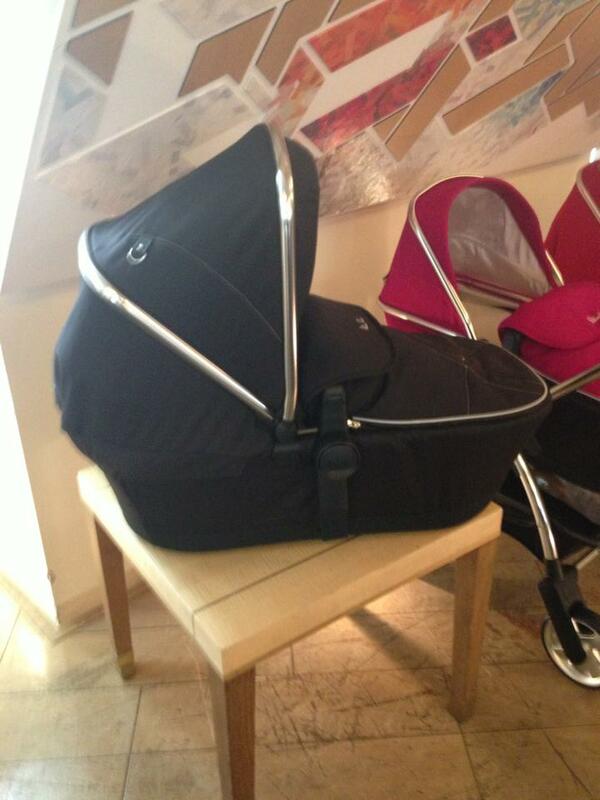 This is the carrycot, it comes as a black base and then the hood and apron can be any of the 7 colours packs that can be purchased seperately. 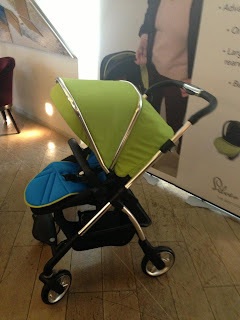 Available in 7 colourways including; chilli, purple, fuchsia, black, beige, electric blue, and lime there is endless possibilities for this very colourful pram. With matching liners available at £30 which have a different colour on each side too. The liner is made from neoprene and is so spongy and very comfortable. The hood and apron colour packs are at a cost of £100 and are bought separately from the pram combination so that the buyer gets to choose what colour they would like and can also change colours if they wanted to by buying other colour packs. This is the black seat unit with lime accessory hood which gives fab coverage and the chrome detailing looks really good around the hood edge. Also seen is the neoprene liner that is available separately, although I highly recommend it as it was so lovely and comfy. Also if you notice on the hood in this picture there is a small black toggle with a hook on it, this is so you can attach toys to the hood and there is also one on the carrycot apron which is a lovely little added feature. Slightly reclined using the amazing one hand recline mechanism which was so easy to use and gave a lovely transition between sitting up and sleeping. It does lay flatter but we had a small protest from the test driver when I did lay fully reclined as it clearly wasn't sleep time! Front view, this is my 7 month old giving it a good test drive. As you can see the hood is lovely and spacious and has good head clearance. 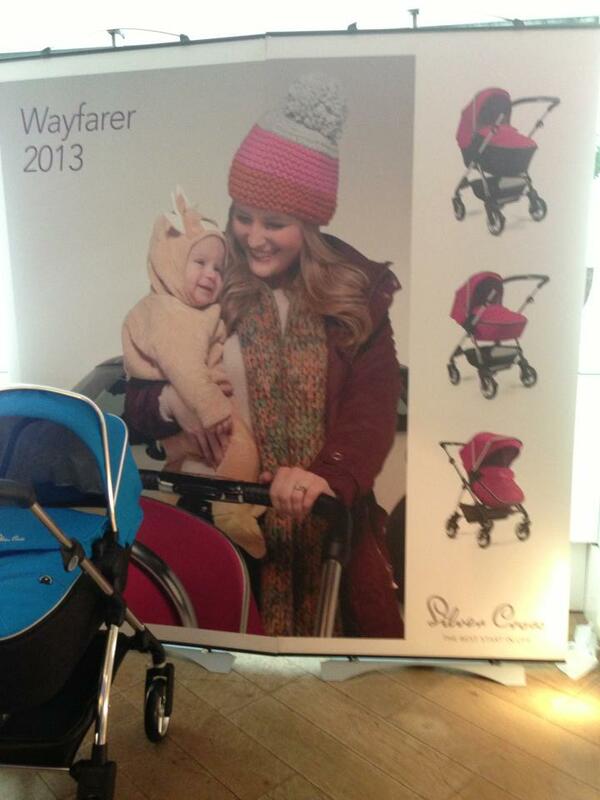 WAYFARER PACKAGE COST WILL BE £395 FOR THE CHASSIS, SEAT UNIT, CARRYCOT, CAR SEAT ADAPTORS & CUPHOLDER. You then purchase your colour hood and apron separately. The Wayfarer is currently compatible with the Lascal buggy board but Silver Cross are in the process of making their own board to fit it too. Along with a summer hood coming a few months after its release and hopefully special editions coming in 2014 this makes for very exciting times for Silver Cross. Also within the package when it is first purchased is included a set of car seat adaptors for the new Simplicity car seat that I also got to see at the launch. Available in 4 colours and priced at £130, this car seat was geared towards newborn up to 13 kg in weight but designed towards bigger babies and growing room that is needed and also so they can stay rearward facing for as long as is possible. It has a fantastic one handle paddle adjustable seat headrest and shoulder strap adjuster which was fab and so easy to do, no fiddly threading in and out of straps as baby grows and the lovely padded headrest moves as they grow too and gives lovely head support. With a five point harness hood and apron it was a lovely sized car seat but very cosy looking. The blue seat belt guides for fixing it into the car made it very easy to use. When Silver Cross were testing the car seat whilst it was in production they found that 85% of people could fit it without needing to see the instructions which is very impressive. It also has an optional Simplifix Isofix base which can be purchased separately at a cost of £125. Excuse my photography again. This is the Simplifix Isofix base for the car seat. Pictures of Simplicity car seat to follow. Its superior impact system is different from others on the market and its easy to remove and fit again covers and fabulous. They just clip back into place after a wash which is very good as ill fitting covers mean that the car seat doesn't work as well as it should so covers that aren't so fiddly to fit back once removed is lovely to see. Overall I was VERY impressed with this pram and car seat combination and is a contender for new pram in the Bovington house for sure! It hits the shops in May and I cam see it being very popular and hugely successful for Silver Cross. 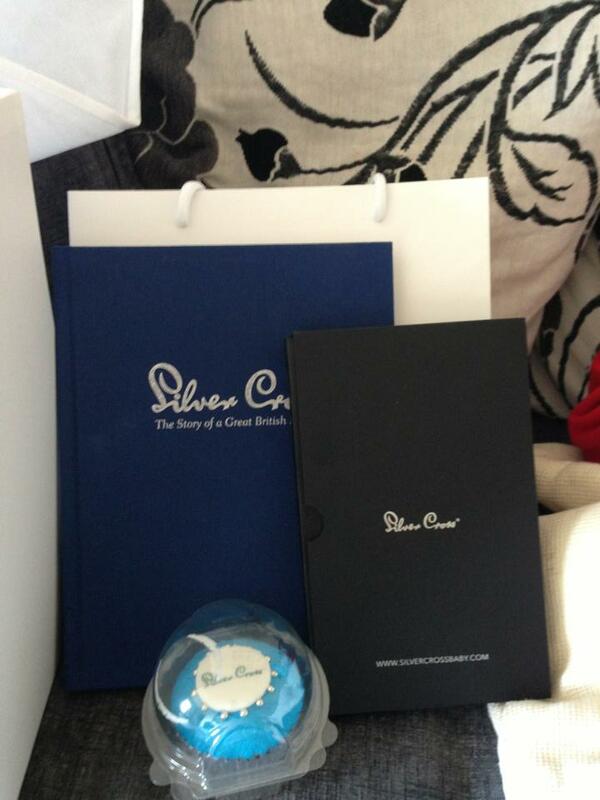 I would also like to thank Silver Cross for the wonderful product launch and letting us be part of it. Thank you for our wonderful gifts and a lovely day. This is what happens when you travel into London for the day! My wonderful gifts, the cupcake was delicious and the book is the History of Silver Cross signed by Alan Halsall. It makes for a wonderful read with some lovely pictures of old and new products and show how passionate the Silver Cross team really are. Great post. I remember the Wayfarer, my Mum had one for my birthday. 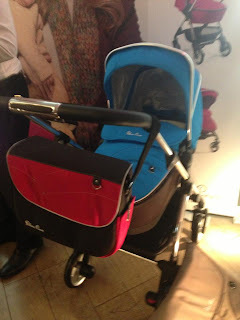 The new pram looks great, I love the mix and match elements, a great way to make your pram look really unique! Thank you Pippa, I tried to cover everything from the launch. I loved the Wayfarer and a lot of friends have always commented that they owned one and would like to see it return so was pleased to be invited and see the relaunch. Try again without spelling errors! 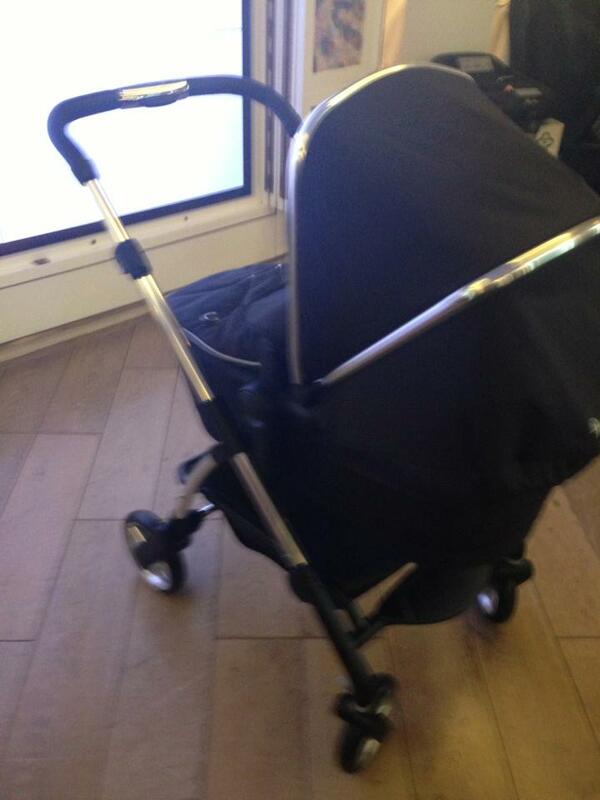 Great post Laura, it's a shame my buggy days are over! 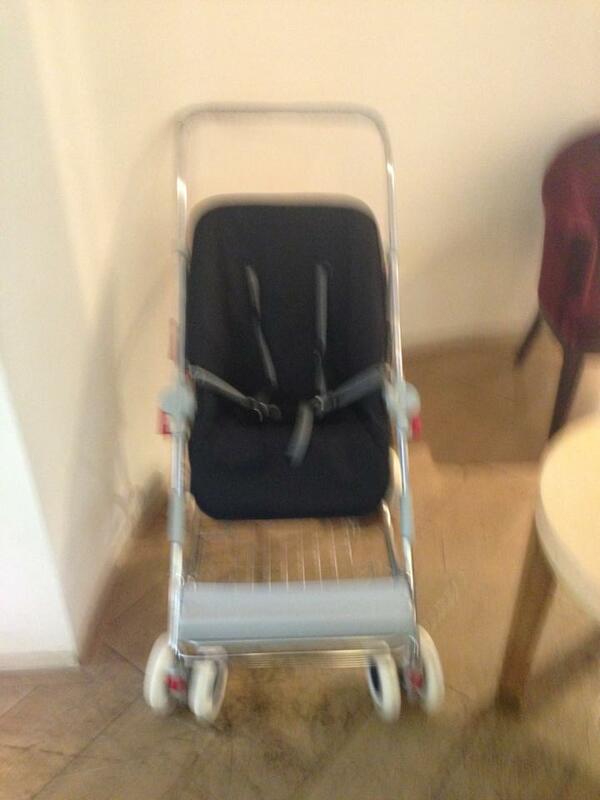 Does anyone know of anyone that is selling an Original Silvercross Wayfarer Pushchair? Ive looked everywhere!!! It is necessary to have this. But for some reason sometimes it may be damaged. So people should not wait and should get it repaired from Dublin Timing Belt as soon as possible.